Living or even traveling in Vietnam isn’t quite as easy as it is in much of the world, but two things it has going for it is that it’s incredibly cheap by international standards, and the food is excellent. Combine the two and you are in heaven as long as you enjoy this sort of Asian cooking and the local fresh ingredients. And before we get too far it’s worth noting that the only places that have dogs or cats on the menu are a very few specialty restaurants in certain sections of certain cities. You’ll never get it accidentally, as the beef, chicken, and pork will always be cheaper locally. This is perhaps the most polarized country in the world when it comes to how the locals eat compared to how tourists and expats eat. While many or most tourists will try the local style at least a time or two, they usually settle into the tourist restaurant scene, and the locals will never be seen in the tourist restaurants unless they happen to be a business person with Western clients. 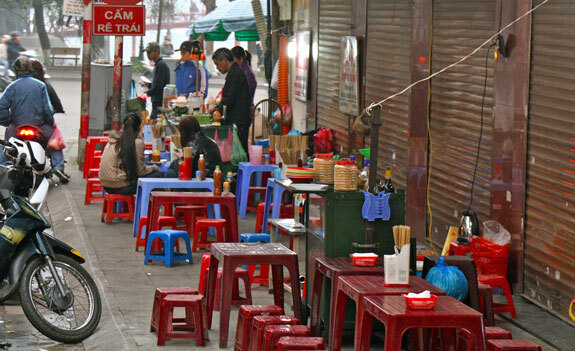 With a few exceptions for Vietnam’s upper class, locals all eat nearly every meal at these sidewalk or alleyway restaurants, which nearly all specialize in exactly one main dish. So if you are in the mood for noodle soup, you go to one place, but if you are in the mood for a rice dish you’ll go to a place 20 meters down the sidewalk. There are no English-language menus, and rarely any menus at all. The locals know what the dish is and the price, so there is no need. Tourists will often be overcharged at these places, but it will still feel very cheap. One difficulty for many tourists is that seating at these places will always be plastic chairs in children’s sizes, so you eat very low to the ground. These cheap and small plastic chairs are easy to haul away at night, and they stand up to the massive rainfall. Every city where tourists or expats go will have plentiful tourist restaurants with names or signs in English. A few of these also use plastic chairs, but for the most part they are all indoor, and either have fans and a good breeze or they have strong air conditioning. Prices start at around US$1 for main dishes and often top out around US$4 for the fanciest thing on the menu. Speaking of menus, every one of these restaurants has a menu that is around 20 to 30 pages long, filled with literally hundreds of choices. They all serve local Vietnamese dishes, along with pasta, sandwiches, and some Chinese dishes as well. Many also serve pizza, but it’s usually terrible. Currently these tasty baguette delights are a trend in Europe and North America, but to get the authentic ones you’ll of course have to come to Vietnam. They come in different sizes and with different toppings based on the city you are in, but the most common configuration has cilantro, pate, tomatoes, cucumbers, and some other fresh veggies. They are always US$1 or less, and are sometimes served for breakfast as well as late night snacks. 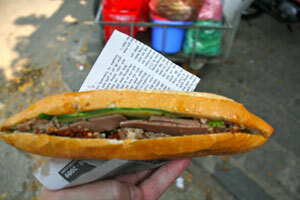 Many think the world’s best bahn mi is served in Hoi An. This famous dish (pronounced Fuh) is served all over Vietnam, with each major city having its own special style. Many prefer the glass rice noodles common in Hanoi, while others prefer the wheat-style noodles down in Saigon. You can usually get it with chicken, pork, or beef, or a bit cheaper in a veggie state. Bún means a type of noodle, bò means beef, and Huế is the name of the town that this particular dish is popular in, but you can get varieties of bún soup all over Vietnam. The main flavor is lemon grass, and you can get it with just veggies or different meats as well, but the classic beef version is the one your should try if you can. It’s served with lime wedges, bean sprouts, and a big handful of herb leaves that you can add in to your liking. This is a different style of noodles, served in a sauce rather than in a soup, primarily in Hoi An. The classic version comes with thick pieces of pork on top, but you can get it other ways as well, and the most distinctive thing is the ones in Hoi An are all supposedly made using the water from one special well. 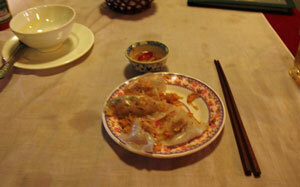 This one is called White Rose on all the English-language menus, and they consist of shrimp dumplings bundled up in a thin and almost clear wrapper, twisted into a rose shape. Portions are a bit small on these generally, but they are cheap and tasty, and another dish most famous in Hoi An, which is the unofficial food capital of Vietnam. When you visit Vietnam you’ll find many dozens of other local specialties, and many books have been written on the subject. The dishes mentioned above are among the most famous, and each can easily be found for around US$2 per portion or less. If you are fond of Asian food, Vietnam should be high on your list.